Sharing a prayer of thanks or "saying grace" before beginning a meal is common in various cultures, religions, and spiritual traditions. 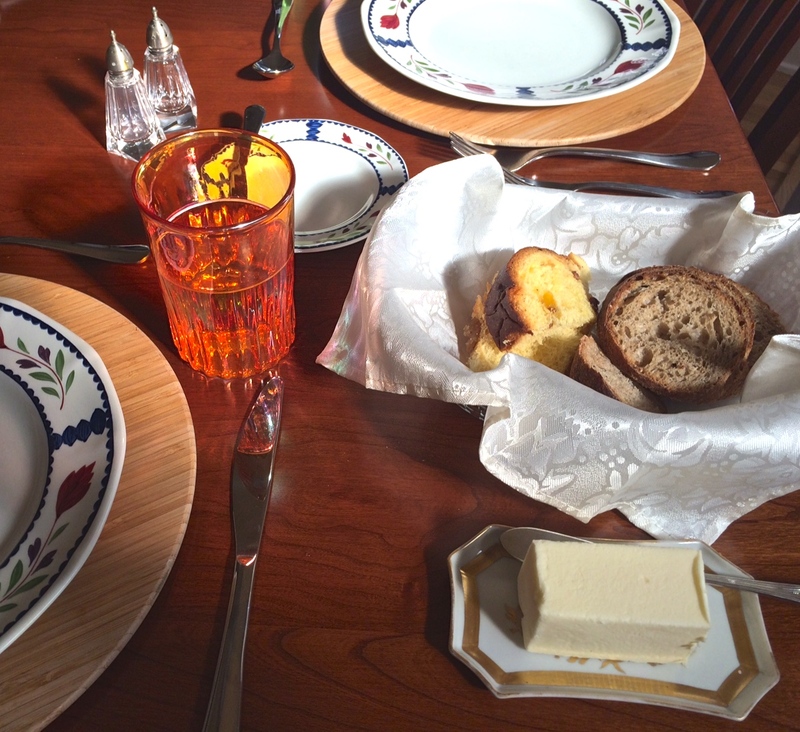 A host, family member, or appointed guest speaks a few words that center on the meal, and then everyone begins eating. For many households, this is a beautiful tradition that is passed down through generations. Whether or not children and grandchildren continue in the religious convictions of their elders, they hold dear the memory of how meals were begun, and many carry on the tradition out of respect. Typically, the person in charge of the household is in charge of saying the prayer before a meal. Some family members may take turns as a gesture to teach youngsters the protocol of this custom. In some households, families hold hands during the prayer. When hosting guests in your home, you are not obligated to change your customary practices. If you know your guests are not familiar with your beliefs or practices, a brief explanation may put them at ease. Of course, guests may or may not choose to participate, but doing so as a gesture of respect is considered polite. However, your guest is obliged to sit quietly through the prayer. A kind host would never ask a guest to do something that is uncomfortable or against his own beliefs. With this in mind, you might omit the hand-holding portion of your tradition, or give your guest the opportunity to opt out of participating in your prayer. But do this as an aside, and quietly, so as not to single out your guest. After all, you invited this person into your home with good intentions. 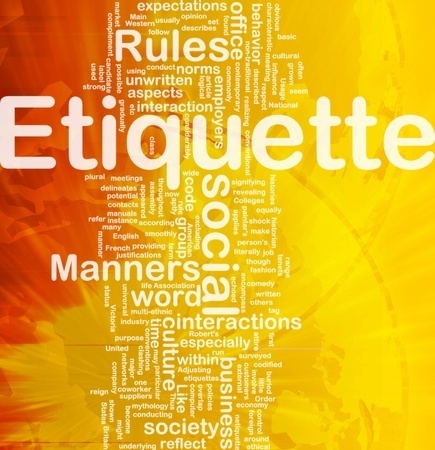 If you would like to ask your guest to offer the blessing for the meal, do so privately before gathering at the table. In the case of a dinner party in your home, you might do an abbreviated version of saying grace, announcing that you would like to give thanks for the meal and then doing so without much fanfare or hand-holding. But if you know for sure that everyone attending shares the same belief and tradition you do, it is appropriate to stay with your usual custom. It is not customary to offer a prayer at a public or secular event, unless everyone at the event is in religious agreement. Even so, saying words of thanks can be entirely secular and gives the host a chance to show gratitude to those who organized the event and prepared the food. This may also be done at the end of the meal, providing a pleasant and upbeat closure. Of course, having a moment’s pause to silently offer a private prayer of thanksgiving is always appropriate. If a host or another guest sees that someone has reserved a private moment of silence with head bowed, he should not interrupt or say anything that might be viewed as disrespectful. 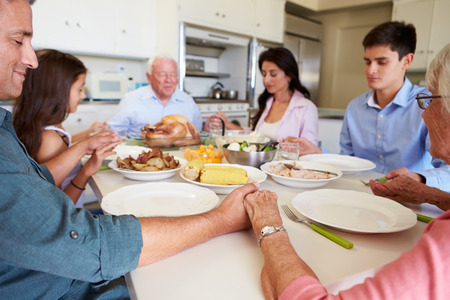 One reason we observe the dining rule of waiting for the host to begin the meal is because there is a chance that a blessing or prayer may be offered. The general rule is that the meal begins when the host places her napkin in her lap. Therefore, if a prayer is to be said, it is best to do so before the meal officially begins. As a guest, especially if you are only vaguely familiar with your host's customs, be sure and follow this guideline. But also, proceed slowly at the start of the meal to ensure you aren't participating in a prayer while your cheeks are bulging with bread. Your host may be one who prays after the start signal. If you feel compelled to request to say a blessing, do so in a private aside with your host. Remember, you are a guest, and your host may already have a plan as to how the meal will proceed. This does not always include a redirection at the request of a guest. If your offer is declined, accept it gracefully. And if your host requests that you pray before the meal, hopefully in a private aside, you are not obligated to do so if it makes you uncomfortable. Decline gracefully, and perhaps suggest another guest who may be better suited for the task. Reserving a moment at the beginning of a meal for appreciation gives a chance to slow down, focus on physical as well as spiritual nourishment, and unify the friends and family members seated at the table. It is a practice grounded in gratitude; something that benefits everyone.